Yes the Hubert H. Humphrey Metrodome will continue to be an eyesore amid the Minneapolis skyline, but fortunately later today it may host its last Major League Baseball game ever. I'm not just rooting for the Tigers because the Twins are the hotter team, and thus a tougher opponent for the Yankees, but because The Metrodome is an atrocious baseball stadium. It was a state-of-the-art multi-purpose facility when it opened in 1982, but let's face it - it was never really meant for baseball. And the Twins themselves were always second-class citizens there in their home stadium. Just yesterday, with a rare jewel of a baseball game - a 1-game Divisional Tiebreak (they only come around so often) against the Detroit Tigers on tap, the Twins were forced to move the game to Tuesday because the Favre/Vikings had a Monday night game. I was actually witness to this type of mess on October 2, 2004. I was the producer for Penn State - Minnesota at the Dome. It was a 7 PM CT start. The fact that Minnesota won 16-7 to run their record to 5-0 was beside the point. Read: Multi-purpose facility. Earlier that same day, the Twins, who had secured a playoff spot, were fighting for home-field advantage in the final regular season weekend versus the Cleveland Indians. The game started at 11 AM CT to accommodate the Gopher football game later that same day. 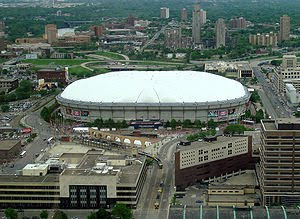 But after 11 Innings and a 5-5 score, the game was suspended so that Metrodome personnel could ready the field for football. Twins Manager Ron Gardenhire was irate. "We're in the middle of a mess now...We don't need a stadium? C'mon." The Twins wound up winning in the bottom of the 12th, on Sunday. The way the Twins have been treated by their landlord is only part of the story. While the building has hosted two World Series Championships, it is still a joke as a baseball venue. There's that ridiculous baggie in right field covering up the folded up extra football seats. The air conditioning system can be manipulated to create more/less intense wind currents to help/hurt the team that's batting. And we've seen countless quality Major League outfielders lose the ball up against the Dome roof, which of course is the same color as the baseball. Next year, the Twins will finally move to their own stadium, and I look forward to my first trip to Target Field in downtown Minneapolis - where the home team will really be the home team. Game 7 of 1991 World Series at the Metrodome was one of the most distasteful sports moments of my lifetime.